City logistics in Amsterdam (NL) is becoming more complex resulting in unnecessary extra mileage and higher costs. 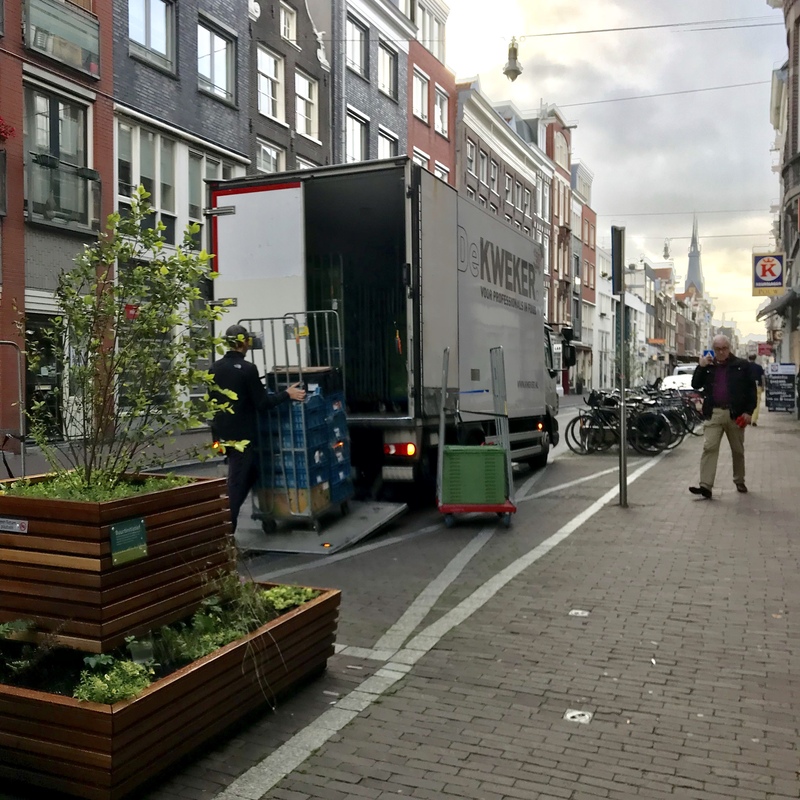 At the end of 2017, the city of Amsterdam, together with Stichting Connekt, Topsector Logistiek and Amsterdam Smart City, wrote a competition: who would come up with a smart solution for the logistical problem in the city center? The winning concept of Connection Systems and Technolution will soon start with a smart loading and unloading zone pilot on the Overtoom in Amsterdam. Project manager Erik Regterschot tells more about the project: “City logistics has a significant footprint. Sustainable city logistics is therefore high on the agenda of the municipality of Amsterdam. Together with parties such as Connekt, Top Sector Logistics, and Amsterdam Smart City, we are actively working on the Green Deal ZES: in 2025 – and where possible earlier – we want the city of Amsterdam to be zero-emission. We do this, among other things, by subsidizing electric vehicles and granting special exemptions”. But besides cleaner, we also want to city logistics to be smarter. How can local government better regulate city logistics? What are the ways in smart use of public space in urban logistics? The competition was about two challenges. The first was: how can we organize the loading and unloading sites in the city as efficiently as possible? There are enough places, but regularly there is a car, touring car or taxi parked illegally. This means that the truck has to load or unload on the carriageway, or kilometers must be driven through the city; 10% of the Amsterdam kilometers are ‘search kilometers’. Should a loading and unloading place not be used as a regular (bicycle) parking space or a terrace during the hours when it is not being used? Loading and unloading zones are also only used binary. But the use is not intelligent or flexible. The first challenge was to come up with a solution for this. The second challenge is about the exemption and intelligent access policy in the city. If you receive an exemption, it applies immediately for the whole year, while you may actually only need to enter the city on Tuesday afternoon. That can also be much smarter; related to weight, safety, emissions, and available space. This challenge is still ongoing. The winning concept is a collaboration between Connection Systems, a supplier of smart camera systems, and technology integrator Technolution. Soon they will start on the northern part of the Amsterdam Overtoom at three large loading and unloading sites with the pilot. It consists of three parts: a camera, a LED board, and a software system. With license plate recognition (ANPR), real-time registration is made of the type of vehicle when at the loading and unloading zone. If it turns out that a place in the afternoon is hardly used to load and unload, you can use the place for something else. Messages on the LED board help prevent abuse of the place; ‘Please note, your vehicle can not stand here!’. With the software system, drivers can log in to see availability or reserve the spot. The combination of these three components provides a lot of data for a more efficient use of the loading and unloading zones in the city. DDigital enforcement is also easier. The pilot will take half a year. After that, scaling-up is needed and municipalities must work together so that transportation companies have the same regulations in all cities.